Hello everyone and welcome to the second edition of our newsletter for 2018. This week's newsletter focuses on our first Dependent Residential School for the year. It was a fabulous week, with students from across the NT in attendance. A huge thank you to all staff for their organisation, participation and hard work. A big congratulations to all the students who attended for their positive attitude to learning and genuine respect and response to the program that was undertaken. All students now all have a very solid launching pad for success with their studies in the year that lies ahead. You will be able to read and see more about the week further on in the newsletter. On Thursday 1 March we held our School Council AGM and March General Council Meeting. We are always keen to have parents represented on School Council and if you would like to be involved, please contact the school reception on 8922 2222 or ntsde.admin@ntschools.net. You can read more about who our current members are further on in the newsletter. NTSDE Student Traffic Light Progress Reports have been completed and sent out this week. If you have any concerns about your student’s report please be sure and make contact with the relevant coordinator and or teacher. Often early intervention into a student’s progress can result in a positive outcome in terms of student achievement at the end of semester. NTSDE encourages any parents who are interested in nominating for School Council for 2018 to contact the school reception on 8922 2222. We currently have one parent vacancy. On Monday February 26, NTSDE welcomed 33 students to our first Residential for the 2018 school year. Students came from all regions of the Territory including Yulara, Alice Springs, Jabiru, Maningrida, Milyakburra, Warruwi, stations in the Barkly and Tanami plus students from Dundee and Darwin itself. Students were welcomed by the Principal, Ms Marcia Harvey at 8.15am on Monday morning. After this, they received their lesson timetable, daily notices and then readied for classes at 8.35am. Most students had English and according to teachers, students were absolutely focused and engaged. At morning tea a few parents dropped by to partake in the wonderful morning tea spread and to meet with teachers and staff. NTSDE welcomes these special opportunities to gather with the school community. The focus of this Residential was for students to meet with their teachers and peers and have the opportunity for face-to-face discussions around subject content and shared understandings which will only assist in successful outcomes for the students. NTSDE students were able to join with Darwin High students at lunchtimes in the gym as well as having access to the Darwin High Library and the welcoming surrounds. This year’s afterschool activities included a sports program organised by Ms Cuttriss, robotics organised by Ms Ross and Menzies School of Health stations organised by Ms Cox. A big thank you to the teachers for these events which the students thoroughly enjoyed! Additional class activities saw excursions to Flip Out where Mr Brannelly did not wear tights! Darwin Military Museum, Break Out, King Pin Bowling and the Bureau of Meteorology. The bowling champions were Brando and Hunter. Another successful Residential was capped off by the awards and Morning Tea event on Friday where Seralda Daiyi was awarded the 2018 Spirit of Learning Award. Seralda showed commitment and enthusiasm in her studies across all subject areas. We are loooking forward to seeing everyone again in Term 3 for the Year 10 /11 Residential and the Year 12 Completers Residential. Here's a few video grab's from students and teachers who were making the most of this terms residential school. Thanks to key filmer Ms Vanessa Cuttriss. Students were actively involved in a ‘multi-sports’ session in the Darwin High School ‘tank’ (gymnasium). I was so impressed that all students brought their enthusiasm along and played basketball, back-board AFL, handball, indoor hockey, soccer, ultimate frisbee, table tennis, and had a great laugh playing basketball using a swiss ball! Congratulations to Ebonnie Lockwood and Rohan Bramwell who were awarded prizes for their sporting skill and effort, voted by their fellow students. Throughout the week students had opportunities to go ten pin bowling at King Pin, trampolining at Flip Out, and join in with lunchtime sport every lunchtime in the tank, mixing with Darwin High School students. The Stage 1 PE students should be really proud of their team building abilities; they managed to solve cryptic problems and puzzles, unlock secret codes, communicate with others and successfully ‘Break Out’ of one of the new Break Out rooms in Darwin city. Students had two minutes to spare, ‘breaking out’ in 58 minutes! A quick reminder that Year 10 and Year 11 NTSDE students are welcome to join in on the Darwin High School 2018 ski trip to Perisher (NSW). It is very popular and has limited spaces so express your interest asap (see below for more details). 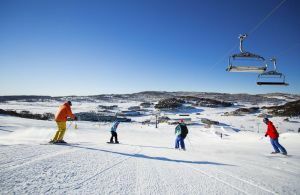 Eligible NTSDE Year 10 and 11 students have been sent an invitation to join with Darwin High School students on an Alpine Excursion to the Perisher Ski Resort from the 21 - 28 July 2018. The Darwin High School ski trip is being fully supervised by Darwin High School staff. As mentioned last year, NTSDE students who meet the eligibility criteria would have some unique opportunities associated with NTSDE being co-located on the Darwin High campus. This is one of those opportunities. Places are still available but are filling fast! All costs associated with this trip are paid for by parents. This includes travel to and from your home location to Darwin. Any questions regarding the trip please contact myself in the first instance – bev.wilson@ntschools.net. During the recent Residential, the 2017 SRC members stood down from their positions. The students were then given the opportunity to nominate for this year’s SRC. After nominations were taken, the students voted. We have established a weekly IDL meeting and I look forward to a very productive year with this enthusiastic assembly of NTSDE Students. NTSDE has just completed the Traffic Light Process as indicated on the NTSDE 2018 Planner. Traffic Light Reports are currently being emailed. Please note that Traffic Light Reports are only sent where teachers have indicated that the students’ engagement in their courses is either Red or Amber. The intention of the current Traffic Light Reports is to provide a snapshot of student engagement in their NTSDE course(s) up until Term 1, Week 5. NTSDE teachers have used information from the students weekly lesson attendance, engagement with formative assessment tasks or Moodle and other course support materials to generate this snapshot. The Traffic Lights Reports are designed to prompt contact between students, parents, home school contact personnel and the NTSDE subject teacher to discuss strategies that students may use to improve their learning and achievement. Students engagement in their NTSDE course(s) to date is satisfactory. Students engagement in their NTSDE course(s) to date is of some concern, changes need to occur to promote the best learning opportunities for the student. Students engagement in their NTSDE course(s) to date is unsatisfactory and, if continued, may result in failure to succeed in this subject.